To get convincing Native American flute melodies, you don't even have to use the keyswitches, mod wheel, or pitch wheel. By simply varying your playing velocity, you can put together beautiful sounding melodic lines that sound like a recording of someone playing an actual Native American flute. 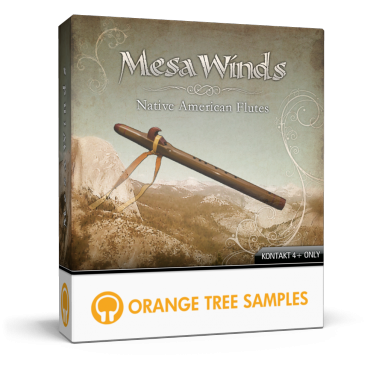 MesaWinds™ is an extensively-sampled collection of six Native American Flutes in a variety of different ranges. The library features a powerful scripting engine that gives these flutes unparalleled realism, and instant playability. This is achieved by intelligently interpreting MIDI data, whether you're playing live from your MIDI keyboard or controlling it from your sequencer. We've also included controls to customize the built-in environments to change the tone of the flutes. The mapping is also completely dynamic, allowing you to move the articulation keyswitches to whichever keys are most convenient for you. This product requires a total of 5.6 GB of free disk space in order to download and install the sample library. The total size of the download is 2 GB, and after installed the library occupies 3.6 GB.